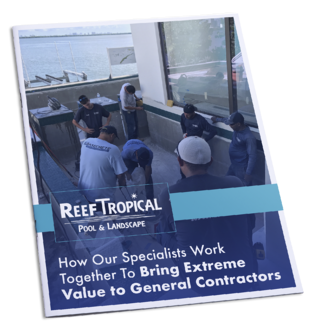 Discover why we're one of the most trusted pool and landscape companies in South Florida! Reef Tropical redefines the essence of pool and landscape installation and service in South Florida. With a staff of more than 90 dedicated service professionals, we design, build and maintain pools and landscapes for more than 1,200 unique customers. Reef Tropical builds roughly 40 to 50 pool and landscape projects a year for clients ranging in needs, sophistication and resources. Our experience and knowledge helps any project thrown our way — whether that be repairing and servicing a pool or enhancing a landscape. We give our customers a tropical paradise with minimal maintenance so they can just sit back and enjoy it. Reef Tropical has all of the expertise, insurance, locations, staffing and quality to increase the beauty of your property and lessen your responsibility.